Essendon is a residential suburb 8 km north-west of central Melbourne. Its western border is Hoffmans Road and its eastern border is the Moonee Ponds Creek. Essendon North adjoins Broadmeadows, across the Moonee Ponds Creek and Niddrie and Essendon West run from Hoffmans Road to the Maribyrnong River. Pastoral land sales of surveyed lots from 8 hectares to 130 hectares began as early as 1838 in the vicinity of Essendon. The place names were Pascoeville (today's Pascoe Vale), Moonee Ponds and Tullamarine. The Moonee Pond's Farmers' Association, forerunner of the Royal Agricultural Society of Victoria, was formed in 1848. The Anglican St Thomas' church (Moonee Ponds) opened in 1849. The road travelling north-westerly through the district became a main route to the gold diggings in 1851. It developed hotels and other facilities for gold seekers en route to the diggings, and was named Mount Alexander Road. In 1852 a town and a suburb, Essendon and Hawstead, were gazetted, bounded by Woodland Street, Lincoln Road, Buckley Street and (partly) Moonee Ponds Creek. It is thought that the name came from Essendon in Hertfordshire, England. Churches and schools were opened between 1853 and 1856 – Presbyterian, Methodist and Catholic. On 23 December 1861, the Essendon and Flemington borough was proclaimed extending from Woodland Street in the north to the North Melbourne-Footscray railway line in the south. The river and the creek were the western and eastern boundaries. The year before a railway line had been opened from North Melbourne to Essendon, and the terminus remained at Essendon until 1872 when it was extended to the Seymour area. The line, however, was privately owned, and it was closed between 1864 and 1871 when the company failed. The break in the period of the train service and the non-appearance of trams during the 1880s when Melbourne's eastern suburbs were laying tram cables probably retarded the residential development of Essendon. Subdivisions and speculation were plentiful, but most house-building was closer to Melbourne at Moonee Ponds and Ascot Vale. In 1891 about half of the borough's houses were in Ascot Vale and less than one-sixth in Essendon proper. Moonee Ponds had a railway station and the town hall (1886), near the busy Mt Alexander Road. The borough was reduced in size in 1882 when Flemington and Kensington were severed and constituted a separate borough, although it had the compensation of being upgraded to a town two years before. One of the 1880s subdivision estates gave a place name to the Essendon area. Aberfeldie is in an elevated part of west Essendon, overlooking the Commonwealth Explosives Factory on the opposite side of the Maribyrnong River. It is described separately. Essendon has several private schools. The earliest is Essendon Grammar, originally the Anglican St Thomas' school, 1855. It was acquired by the Presbyterian Church in 1945 and united with the Penleigh Girls' school, Moonee Ponds, in 1977. The Anglican Lowther Hall Girls' school (1920) was formerly the residence of two notable personalities – the brewer Collier McCracken who built it in 1890-91 and the flamboyant bookseller, E.W. Cole, who retired there in 1911. The Catholic church has primary (1923) and secondary (1897) schools. Essendon high school was opened in 1914 and the technical school in 1939. The technical school was the 'descendent' of the trades school in King Street, West Melbourne. Essendon primary school was opened in 1858 as a National school, and the district's other State primary schools are in Ascot Vale, Moonee Ponds, Essendon North, Aberfeldie and Strathmore. The high school and the technical school are heritage listed. 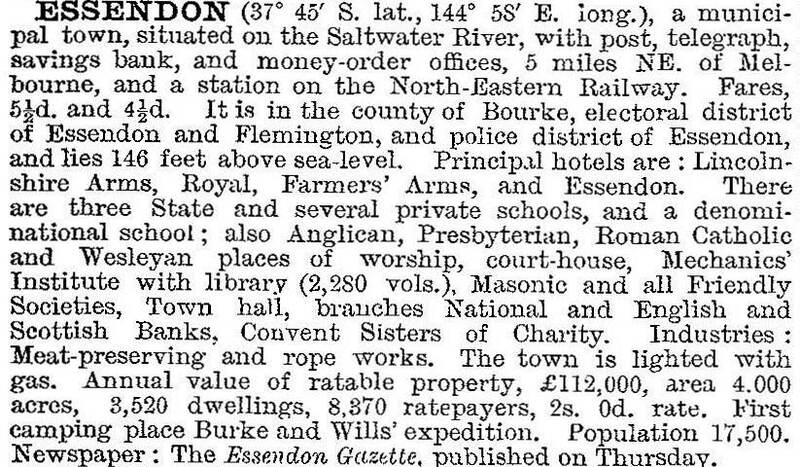 Essendon's shopping and recreational activities were focused mainly on Puckle Street and Moonee Ponds. Ascot Vale also drew attendances at events and entertainments. Essendon proper did not have a hall until 1913. The Maribyrnong River, however, attracted excursionists by paddle boats to Hicks tea gardens, near Aberfeldie (1910). The period coincided with the Essendon River League's efforts to beautify the river, and a Henley on the Maribyrnong venue was developed. The Essendon Football Club was formed in 1873, but until the 1880s played in the Ascot Vale area. It was a founding member of the Victorian Football Association (1877) and of the breakaway Football League in 1897. Between 1882 and 1921 the Club could not get a home ground in the Essendon area (playing at East Melbourne), until the council relented and gave it use of the 'Windy Hill' Essendon Reserve. The club was later named the Bombers, probably from association with the nearby Essendon Airport. The airport land was purchased by the Commonwealth Government in 1921 (in preference to a site at Fishermans Bend), and became an international airport in 1950. Its role was adjusted to mainly freight and light aircraft when the Tullamarine Airport was opened in 1970. Formerly in Essendon North, it is now named Essendon Fields and has a shopping centre on its southern boundary. Essendon's accessibility was improved by the tramline opening from Flemington Bridge (Moonee Ponds Creek) to Keilor Road in 1906, coinciding with the opening of the tram service through Ascot Vale. The tram was extended along Keilor Road in 1923 to the Essendon North primary school (1920), and then in further stages around the side of the airport in 1937 and 1943 to the airport entrance. The tram, however, skirted rather than went through Essendon North and Essendon West, which had space to absorb new houses during the postwar years. The Essendon high school (1914) was supplemented by the Buckley Park high school in 1963. Recreation and shopping were not as well supplemented, being restricted to the Buckley Park sports facilities and shopping strips along the tramline in Keilor Road. The railway station north of the Essendon station is Glenbervie, and the next one north is Strathmore. The area of Strathmore north of Wodland Street was transferred from Broadmeadows city council to Essendon on 1 October 1979. The wedge of Essendon North between Keilor Road and the Tullamarine Freeway was transferred from Keilor city council to Essendon on 31 March 1992. In 1993 the State Government embarked on changes to municipal boundaries, and one of its first actions was to reduce Melbourne city council's boundaries. Flemington and Kensington, which had been absorbed by Melbourne on 30 October 1905, were reunited with Essendon on 1 November 1993. On 15 December 1994, Essendon city and parts of Keilor city were united to form Moonee Valley city.